2013 has been an eventful year in my macro journey. Fired about 33,000 macro shots and uploaded close to 6,000 photos - at least 4 out of 5 photos taken were either duplicates (for insurance!) or not ideal for public viewing. I had a shoot every week and came back with 10GB to 20GB of photos each time. This year, I experimented more with various forms of macro photography, including ultraviolet macro, wide angle macro and back-lighting in macro photography. 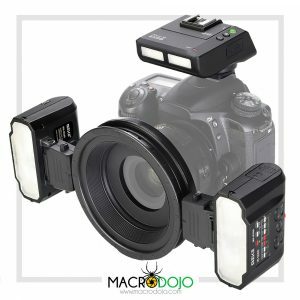 During which, I changed my setup and lighting several times, wrote on macro photography ethics, and I also conducted a few macro photography workshops for several like-minded groups. Last but not least, I've started a Facebook page where I share my photos daily and have over 27k followers since it started a few months ago. 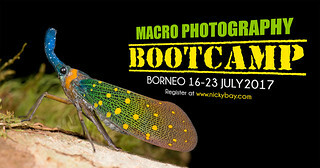 Hopefully it will be a good platform to share all the creepy stuff about macro photography and make new friends! 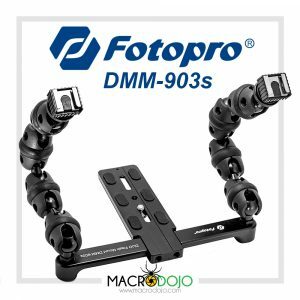 I would like to take this opportunity to thank my group of passionate macro photographers whom have been tirelessly trudging through forests with me every week for the past year. Everyone had their own full time jobs and families, but took a night out each week in search for tiny beauties. A big thanks to Victor, Melvyn, David, Chris, Andrew and James. Thanks for the rides in the middle of the night, for generously sharing your finds with everyone, and for looking out for each other. Heartfelt thanks to you all, I am grateful to be with this bug-crazy gang. As always, I will start with some spider families. The most commonly shot spider at night. Easily spotted because of their size, although some may be mature at less than 1cm! It had been a rainy night. We were looking for velvet worms but found this Huntsman Spider on the forest litter instead. Guarding her scoop of "ice-cream", this lady refused to budge from her nest. 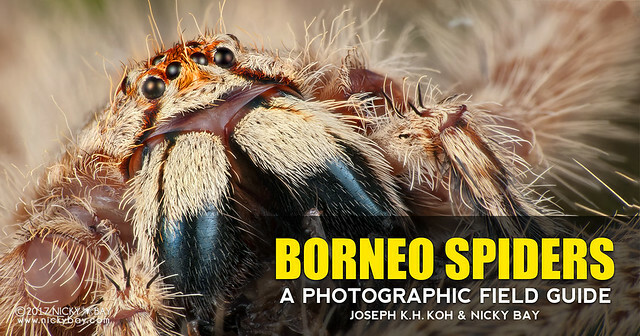 We first saw Heteropoda boiei in Sarawak, but were pleasantly surprised to see it in some places in Singapore. A Lichen Huntsman Spider (Pandercetes sp.) after a moult. Heteropoda devours a large cockroach. It is perched higher due to the size of the prey. Hauntingly beautiful Thelcticopis that we found on Pulau Ubin. First sighting of cannibalism in Huntsman Spiders. Wonder if that was the male? This Huntsman Spider sports a deep tone of red! Tried taking pictures of spiders dangling on safety lines. The results were quite pleasing with a translucent effect. Especially stunning for hairier huntsman spiders! Slightly smaller hunting spiders, but often overlooked as they really looked too... common! Probably seen as a piece of debris dangling from leaves, the entire bunch of spiderlings have cute patches of red on their carapace, paired beautifully with bright green legs. The mother of course, stands guard on the right looking on at her brats. Probably Hamadruas, one of the larger Lynx Spiders. Never got to figure this out. My wife found this when we were in Cambodia, stunning but tiny! A punk Lynx sporting a mohawk. The Peucetia seems to be one of the largest lynx spiders around. This was in my wish list, and we found it near to our restaurant in Cambodia after lunch. With legs outstretched, this adult male could measure 2 inches long! 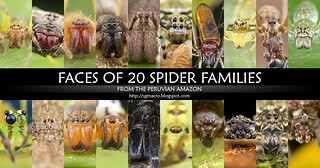 The permanently shocked looks in this family of spiders deserve a gallery of their own. This Rhene has a uniquely flat-topped carapace from the anterior view. It is also my model for the article on Ethics in Macro Photography which I wrote this year. Always a favorite, the Heavy Jumper (Hyllus sp.) 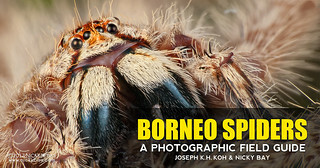 is one of the most popular and easy-to-shoot Salticids in Singapore. Not skittish, slow moving, and large! Found this Mr Eyebrow while I was in Bali for holiday. Some called this Groucho Marx. Some called it Sam the Eagle from Muppets. Siler is one of the most colourful Salticids in this region! This made it here for the cute innocent looking eyebrows. Another Hyllus. Chris called it the gentle giant. One of my macro workshop attendees found this lovely Hyllus with green eyes. Interesting tones on the face, as if it used eye shadow. One of the cutest faces of 2013! Classic OMG look. Cannibalism, although they belong to different genera. Yet another Hyllus, clearly a very sought-after subject! The orchestra conductor, busily mimicking an ant. Heavy Jumper (Hyllus sp. ), one of my favorite compositions this year. This mega family appears to be the most diverse in morphology. 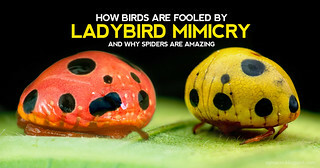 Despite the given common name, many do not actually weave orb webs, don't be confused! This orb web spider decorates its web with debris which looked like prey carcasses. An Argiope busily spinning her egg sac. Look at all the silk! Scarlet Acusilas Spider (Acusilas coccineus) with pearly babies. The classic Spiny Back Orb Weaver (Macracantha arcuata), probably the longest horns amongst all spiny spiders. Tree Stump Orb Weaver (Poltys sp.) demonstrating her camouflage. Scorpion-Tailed Spider (Arachnura sp.) guarding her egg sacs. Paraplectana with a uniformly rich yellow colour. Just for fun, comparing the dorsal view of a Kidney Garden Spider (Araneus mitificus) with the Pringles logo. Cyclosa insulana perched in the middle of its orb web. Spiny Orb Weaver (Gasteracantha dalyi), not as long as M. arcuata but still significantly longer horns than others! Another Tree Stump Orb Weaver (Cyphalonotus sp.) demonstrating its camouflage abilities. Another Argiope with her "egg yolk". Look closely to see the details of the tiny eggs! Another Paraplectana which is thought to be new to science. This Big-Headed Bark Spider (Caerostris sp.) was in my wish list for a long time. Not an adult yet but still a lovely specimen! Second Big-Headed Bark Spider (Caerostris sp.) sighting, each got more exciting than the next! Mother of all Big-Headed Bark Spiders, with a demonic look when illuminated under ultraviolet!! Common ambush spider but there are MANY lesser seen species around! Quite a few Eight-Spotted Crab Spider (Platythomisus octomaculatus) sightings this year. Managed to take a picture of the "8th spot"! A chance sighting of the Eight-Spotted Crab Spider (Platythomisus octomaculatus) while we were shooting the milky way! The Eight-Spotted Crab Spiderling (Platythomisus octomaculatus) popped out a few weeks later. No spots yet! Bird-Dropping Crab Spider, keeps prey under white patches of silk to mimic bird dropping as well! Bizarre looking Crab Spider found during one of our night shoots. Another interesting looking Crab Spider with a nice tone of green. Tiny little spiders that usually make their home under leaves. A male kleptoparasite, Argyrodes lives on the webs of other spiders to feast on their prey. My most stolen photo of the year. 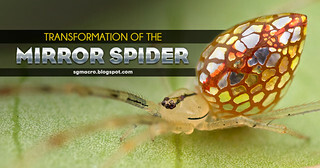 I called it the Comb-Footed Mirror Spider (Thwaitesia sp.) and it was published on several news sites and magazines. Largest Theridiid I have ever seen. This Twig Spider (Ariamnes sp.) easily measured 2 inches long when stretched completely. Somehow all of these got to be called Sac Spiders. Spiny Ant-Like Sac Spider which doesn't look like a corinnid at all at first glance. Mygalomorphae - Tarantulas, Trapdoor Spiders, etc. These larger spiders live in burrows and rarely come out from their homes. Just how many legs does this Brush-Footed Trapdoor Spider (Barychelidae) have? The palps are as thick as the legs and are often mistaken to be the 9th and 10th legs. Close up on the foot of a Tarantula, such beautiful patterns! Found this Tarantula (Theraphosidae) clinging onto her egg sac in the open. Found this Tube Trapdoor Spider (Nemesiidae) in Nikoi Island. Messed around with the leaf litter and found this Brush-Footed Trapdoor Spider. Sometimes, the subjects got angry with us. Tarantula with a threat display. Common for Tarantulas to be infested with mites, especially between the chelicerae. Initially thought to be a tarantula, this blue Brush-Footed Trapdoor Spider (Barychelidae) was found resting in a drain, probably looking for a mate. Where else, but found in my home! Made a special trip to the shore to shoot this Intertidal Spider (Desis sp.). Mega large fangs! Daddy Long Legs Spider (Uthina luzonica) with one of the largest egg sacs I've ever seen on a Pholcid. The elusive blue Wolf Spider taking a break at the edge of a dead leaf. Cannibalism of the Wolf Spider, not sure if that was the male or her spiderling? Big-Jawed Spider (Mesida sp.) 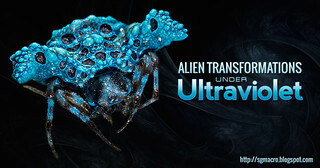 with the metallic abdomen. Wandering Spider (Ctenidae) with a bluish tone, quite small for a Ctenid. Daddy-Long-Legs Spider, where the spiderlings were ready to hatch at any moment! Many other arachnids other than spiders! Long-Legged Velvet Mite (Erythraeidae), different family from the one above! Harvestman (Sandokanidae) moves at slow motion and likes to play dead when disturbed. Taillless Whip Scorpion (Amblypygi) which my wife found in the shower when we were in Bali. Shake hands with this Scorpion (Liocheles australasiae?) will ya? Bugs... my wife calls my group the bug people. But we really shoot more than this beautiful order! The Leafhopper (Cicadellidae) is supposed to be really common, but a green one isn't! A pair of Derbid Planthoppers "sparring"
These Planthoppers seem to always come in rich colour tones! Eurybrachyid Planthopper (Ancyra sp.) which Dani found when we were in Cambodia. One of the most colourful planthoppers around here. Very small planthopper but relatively easy to shoot. Ant-Snatching Assassin Bug (Acanthaspis sp.) with the largest mountain of carcasses I've ever seen on its back! Scale Insect? 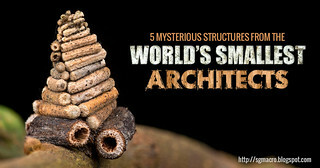 (Coccoidea) One of the interesting discoveries of the year. Will certainly keep an eye for these next time! Looking up close at some beetles often reveal a lot of unexpected details! Longhorn Beetles (Chlorophorus annularis) that I found while I was cycling in Bali. Tortoise Beetle (Cassidinae) saying bye bye to me. Stag Beetle (Lucanidae), really tiny one! Mating beetles oblivious to the crowd around them. Rove Beetle (Neopinophilus sp. ), some may have a potent chemical defence so we were quite wary of it. Straight-Snouted Weevil (Brentidae) getting ready to escape! Cute Darkling Beetle with bunny-like "ears"
To the layman, most just called them grasshoppers. 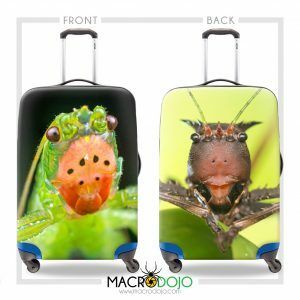 Spot the Forest Leaf Grasshopper! Click on the photo for the answer. Cute little Monkey Grasshopper (Erianthus versicolor) found in Cambodia. Katydid nymph (Phaneropterinae) with a pinkish head. Lacewing eggs, looks like they have hatched! Crane Fly (Tipulidae) taking a break from all the break-dancing. It quivers rapidly to make itself less visible to potential predators. Midge (Chironomidae) with plumose antennae. Mayfly (Ephemeroptera). Wonder why it always seems to be looking at the sky? Ant (Myrmicaria sp.) grooming the queen? Armored Ant (Cataulacus sp.) looked like any other ant if not observed closely enough. Scoliid Wasp (Scoliidae), lots of them in Nikoi Island. Mantis Parasitic Wasp (Podagrion sp.) ovipositing into a mantis ootheca. Cuckoo Wasp (Chrysididae), easily the most beautiful wasp here. Ensign Wasp (Evania appendigaster) preys on cockroaches. Forest Ant (Camponotus gigas), one of the rare moments where it stopped for me to shoot. Not the favorite order as they are often viewed as pests. Armored Cockroach (Catara rugosicollis) gives off a weird smell.. really weird. Winged Termites (Termitoidae) marching in unison. Cockroach (Blattodea) doing a "Darth Vader". Because 90% of my shoots were at night, we hardly take pictures of butterflies now. Puppy Moth found at night in Nikoi Island. On the lookout for these beauties in morning dew! Showcasing some of the more interesting ones we spotted this year! Moss Mantis (Ceratohaania sp.? ), incredibly camouflaged when walking on mossy surfaces. Boxer Mantis nymph (Hestiasula sp.) with crazy spikes on the abdomen. Lots of stick insects in Singapore, but they are also the most difficult subjects to create a beautiful photograph with. Lovely pair of Stick Insects (Phasmatodea) mating. Looked very dull initially but turned out quite nice! These many-legged subjects are abundant in our forests. But which ones captured our eyes? Centipede moulting (Scolopendra sp.) posing with its ex-claws. House Centipede (Scutigeridae), face to face! House Centipede (Scutigeridae) moulting. Rare to see it purple! Turns brown when the exoskeleton hardens. Pill Millipede (Sphaerotheriida) struggling to unroll and get moving. Only know of 1 species in Singapore, but this crazy worm deserves a category of its own! Velvet Worm (Eoperipatus sumatranus?) looking as if it was ready to sing. Velvet Worm (Eoperipatus sumatranus?) with cute knobbly legs. Happy Birthday Singapore! A tribute to the country where most of the macro shots on this blog took place in. Still insects but in lesser known orders. Earwig (Dermaptera), another commonly ignored subject. Usually larger but often spotted in our jungle journeys. Will just document whatever we see!! Reticulated Python (Broghammerus reticulatus) which appeared after the drains flooded from the rain. Inanimate subjects often capture our attention as well. I experimented with a few wide angle lenses, and eventually settled on one lens to bring to capture slightly larger subjects - the Sigma 15mm F/2.8 Fisheye. It is small, and has a very short working distance. I bought countless ultraviolet lights this year to experiment on, and eventually settled on the 365nm range of lights. The results were much more pleasant than the 395nm range of ultraviolet torches. This year, we found that scorpions were not the only arthropods that fluoresce under ultraviolet! I will write a separate post soon on how these photos were taken. Huntsman Spider (Gnathopalystes sp.). The long exposure allowed the struggling prey to appear with motion blur. Katydid in Ultraviolet (Tettigoniidae) reveals crazy vein patterns. 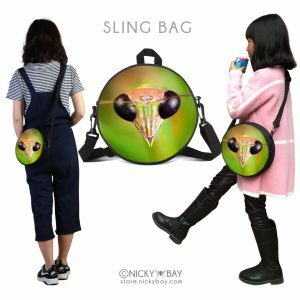 Bird Dung Spider (Pasilobus sp. ), looking like a precious stone. The complete album can be viewed on Flickr.